There are several threads to follow. This poem is actually about the process of writing another poem, "Oranges: 12 Pastorals" that ultimately has no oranges in the final piece at all. He compares his own process to that of his friend, the artist Mike Goldberg who is simultaneously beginning a new painting, "Sardines," of which the little fish also do not make an appearance in the final piece, either. But creativity is funny, isn't it? Often the journey from beginning to end swirls you around and around, and you might end up in a very different place than you once thought you would. That's also the beauty of creativity, too, because if you embrace it, you might be opening yourself up to an even better idea than the one you started with. I love the casual tone of this poem. It's not stiff or formal. O'Hara "drops in" on Goldberg, and they drink and chat and relax for a while. For days like this, a bean salad is perfection. You know that feeling when the afternoon turns to evening but you were busy working so passionately on something that you hardly noticed? Suddenly you look up from your work and it's dark outside, and you might now realize you're hungry and have missed the usual dinner hour. When this happens, make a bean salad. It hardly requires any cooking, and then you can resume your project, or take a break, whichever you prefer. Add a large squirt of lemon, pour a glass of wine, and savor it all. Resist the temptation to make large breadcrumbs. The fish and beans are delicate, so you really want small, olive oil-soaked crumbs that will melt in your mouth. 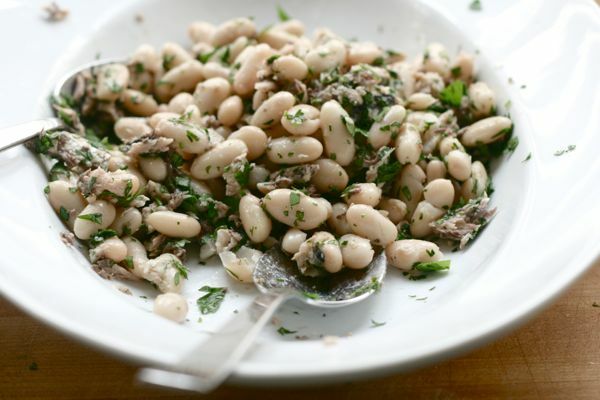 If you plan ahead, make your own beans at home because they will greatly enhance the flavor of the salad, but canned will do in a pinch, which I've included in the recipe below. Gently open the sardines and push away any bones with your thumb to discard. Lightly break up the meat and place it into a serving bowl along with the white beans and parsley. Add extra-virgin olive oil, salt, pepper and lots of fresh lemon juice. Stir to combine, and let the flavors sit together a while as you make the breadcrumbs. Cut the bread into very small pieces, about the size of peas. Add them to a small sauté pan and coat with extra-virgin olive oil. Stir to combine, and be sure the bread is well coated. Season with salt, and cook over low heat until golden brown. Go back to your bowl and taste it. When it's just perfect, add the bread crumbs and toss right before serving.